I arrived in Japan in the spring of '02. Arrogant and unsure, excited and cautious, with just a couple of suitcases and almost no contacts on the ground. Over a decade later it is now time to end this chapter of my life and begin the next one. Over the years I have laughed and loved, cried and screamed, achieved some of my greatest triumphs, spent days cowering in my bedroom hiding from imaginary monsters. I have made a great many amazing friends who will stay with me for the rest of my life, and I have lost a small number whose absence still haunt my thoughts on cold winter nights. I have achieved a great deal, yet I often thought of myself as a fraud. And I have learned to love this place. So much it tears at my soul to leave. But leave, I must. These past few years I have often lamented the lack of leadership in this country, the bleak economic future, the degrading social structure and the lack of good Mexican restaurants. But this is not why I leave. The problem is me, not you. More and more I have noticed my weaknesses getting strong, my strengths slipping away as I have lost my direction. I have been comfortable. I found, not what I longed for, but what made me feel comfortable. I was letting fear of the unknown push me around in exchange for safe, clean public transportation and one of the best lifestyles in the world. I left my apartment every day and never feared that a lion might eat me before I made it home that night. Life was just too easy. Lately I have been looking for a catalyst. Something to take me out of my comfort zone and get me living a forward focused life again. I have been looking for the end of the world. And damn, if I didn't find it. So my apartment has been disassembled, pieces scattered to the winds. I arrived with just a couple of bags and I leave practically in the same condition. Ive traded in all I have for a chance at a new start. And I couldn't be more excited/terrified about it. There are so, so many things I will miss. My comfort spots and my hidden secrets. I'll miss the friends I have made and I'll miss the rich texture of living in one of the most complex and rich cities in the world. I'll miss the world class arts scene and the geek enclave that has been both my home and playground for the last few years. I'll miss the way you can understand what a total stranger is thinking without a look, word, or gesture, but by simply understanding the context of the moment. I'll even miss learning how to be lonely in a city of over 12 million people. Oh, and I'll miss late night combini runs for curry-pan. They are awesome. Luckily i am not giving all this up forever. In truth I expect to be back in just a few months. My new job includes a focus on Japan that will bring me back often and keep this country well on my radar. But this is no longer my home. My hat stays on my head or hand. The next time I walk the streets, it will be not as a resident, but once again as a visiting alien, collecting samples and abducting livestock for dark sinister… Err Ok that one got away from me there. So after ten years and eight months this will be my last post as “Steve from Tokyo”. Coming soon (I hope) will be a posts from my new home and life. For these precious years living in one of the most spectacular cities in the world, from the bottom of my heart, “thank you”. All the best Steve! Definitely gonna miss your tweets about Japan’s quirks! Me and husband are very lucky to have been able to meet and know you! Hope to see you in Japan (or maybe elsewhere even?) again in future ;)! I call myself very lucky to have crossed your path in Tokyo more than 4 years ago now. It might be a different city fabric from now on, but the friendship will stay. You sound a bit like I do when thinking about my current job and what I sacrifice for some safety and stability. Don’t be too hard on yourself. I’ve been amazed at how you managed to make a life for yourself there. I don’t think I could have done it. It sounds like it’s the right time for you to move on. You’ve grown and now it’s time for something else. Congrats! I can’t wait to hear more about it and I’m glad to hear you’ll still be visiting Japan. It’s a nice place to visit. I have you to thank for knowing that. All the best with your next chapter Steve. I will remember with fondness the fun times when we experimented with new tech together and did crazy sh*t. Thank you for your friendship and more importantly thank you for all the support you gave me in my time of change. I am and will always remain very grateful for the selfless kindness you showed. Even though I’ve only lived in Tokyo for 2 yrs, I get what you wrote soooo well! Thanks for all the help you had given me while I was there. I’ve always wished I could pay you back but you were (are still) da boss in Tokyo! So, be SURE to ping me if you ever hop over to HK! I’ll be ready to help you with whatever you need! From The Western World, Google+, and Facebook, I was wondering where I left that comment, so here it is again: I just saw this post, Steve. It’s not exactly a “like” sort of post, but a “seen” one. I miss you already. Keep in touch, and let me know when you’re in town. Oh yeah, and Mac”prosperous” new year! Just saw this post, Steve, and it struck a chord. 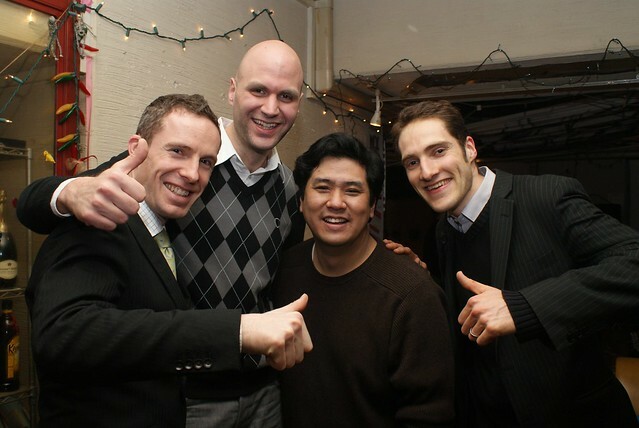 I remember the first time we met (Pink Cow Connections event about smartphones – you and Andrew Shuttleworth were speaking and you took some time out to chat with me and Tomo Akiyama) and chance encounters since then in the flesh and on social media. I’ve always walked away pleased to know you, man. Good luck – hope you find what you’re looking for. Steve!! I just heard. Bon Voyage my friend. I wish you well in your next adventure.